Fawn-breasted Bowerbirds in Australia occur only on Cape York about as far south as Silver Plains, east of Coen.They prefer the more humid environments such as paperbark scrubs, riverside thickets, edges of rainforest or mangroves. 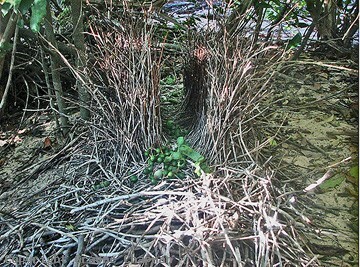 In recent times there appears to be some competition between Fawn-breasted and Great Bowerbirds. Great Bowerbirds normally live in drier situations such as open woodlands and even around human habitation where they can scrounge on scraps. Fawn-breasted are more retiring in nature and not so easily observed. Their bowers are quite different - Great Bowerbirds normally accrue a large pile of whitish objects (shells bones or stones) outside their bowers which makes them stand out whereas Fawn-breasted Bowers simply have a collection of green objects - fruits and berries etc. as in picture 682501.